Software for commercial support and tool useful for technical measurements. 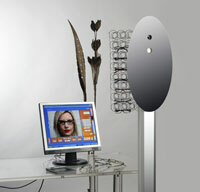 The program, connected to our mirror containing an high solution digital camera, autofocus and equipped with zoom, it allows to obtain, thanks to our innovative system, a perfect measurement to assembly multifocal lenses, becoming a valid support besides image technician. Moreover it allows to take up to 18 different photos, to help the customer to choose his favourite frame.